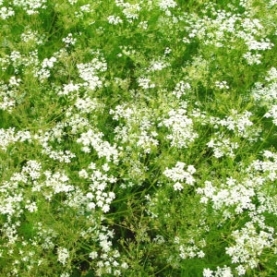 Caraway essential oil is typically used in many digestive blends. The anti-inflammatory, spasmolytic, antimicrobial, antioxidant, carminative and immunomodulatory effects have been used in laboratory studies for IBD, specifically colitis. Caraway is similar in appearance to other members of the carrot family, with finely divided, feathery leaves with thread-like divisions, growing on 20-30cm stems. The main flower stem is 40-60cm tall, with small white or pink flowers in umbels. Caraway fruit (erroneously called seeds) are crescent shaped. The herb Caraway is traditionally used to treat dyspepsia, intestinal colic, menstrual cramps, poor appetite, laryngitis, and bronchitis. A curious superstition was held in olden times about Caraway. It was deemed to confer the gift of retention, preventing the theft of any object which contained it, and holding the theif in custody within the invaded house. Caraway essential oil is helpful in uncovering that which is hidden. When we feel we need a bit of direction, not knowing what to do, Caraway will illuminate the correct path for us. This essential oil assists with creative energy, starting new projects and feeling confident and sure with the new energy that we are in the process of becoming. The anti-bacterial and antifungal actions found in both carvone and d-limonene have been research proven to be ulcerogenic with activity against Helicobacter pylori. This blend will give you 6 diffuser sessions if you add 4 drops to diffuser each time. According to Tisserand & Young, Caraway essential oil can cause skin sensitization if it is oxidized. 1.2% for skin sensitization but only for (-) carvone. Dermal limit for (+) carvone is 23% for toxicity.